Wander through Santiago’s fascinating neighbourhoods and admire the spectacular Andes Mountain views before journeying to the north of the country for adventure in the driest desert in the world, the Atacama. Wander through Santiago’s fascinating neighbourhoods and admire the spectacular Andes Mountain views before journeying to the north of the country for adventure in the driest desert in the world, the Atacama. Continue your discovery of some of South America’s most iconic natural wonders with a visit to the Galapagos Islands, surely one of the world’s most remarkable destinations, and close encounters with an astonishing variety of unique species such as flightless cormorants, marine iguanas and giant tortoises. Day 1: Arrive Santiago, Chile. Welcome to Santiago, one of the world’s most spectacularly located cities. Upon arrival you will be met by your A&K representative who will accompany you to your luxury boutique accommodation in the Lastarria district. Ease into local time with a leisurely stroll through the neighbourhood, discover lively cafés, small boutiques and admire the distinctive colonial-style architecture. Alternatively, you may choose to seek out the rooftop bar for laid-back drinks and Andes mountain views. Begin your Santiago discovery with an in-depth exploration of this fascinating city. Experience the city as the locals do and hop on the famous metro subway system. Then let your feet take over with a walking tour of the colonial centre including the Plaza de Armas. Continue to San Cristobal Hill, journey on the funicular railway to the top for a panoramic view of the city and mountains. Step inside the treasure-filled La Chascona, built by Chilean poet Pablo Neruda for his mistress. Travel back in time at the Museo Chileno de Arte Precolombino, one of the world’s best museums for ancient Central and South American artefacts and explore the colonial centre including the Plaza de Armas. Enjoy an afternoon at leisure. Day 3: Santiago – Calama – San Pedro de Atacama. Private transfer to the airport for your flight to Calama, the gateway to the Atacama Desert, the driest desert in the world. On arrival meet your local driver who will transfer you to the oasis town of San Pedro de Atacama and your luxury lodge, Alto Atacama, surrounded by the tangerine-coloured hills of the Catarpe Valley. Following time to refresh, meet your excursion leader who will discuss the menu of activities available during your stay. Choose from active, moderate or easy; travel by vehicle, bicycle or on foot. Or simply relax by the pool and indulge in a spa treatment until the evening when the dark skies above offer the prefect conditions for viewing the stars above. Days 4 - 5: San Pedro de Atacama. A perfect destination for those who love nature, adventure and extraordinary landscapes, the Atacama Desert has something for all tastes and abilities. Bounded by the Pacific Ocean and the Andes mountains, the 35,000-square kilometre desert is part of a series of arid landscapes that include salt flats, sandy deserts, rocky peaks and active volcanoes. Head out by 4WD, go trekking, ride on mountain bike or horseback and discover steaming geysers, indigenous villages, high altitude lakes and sharply eroded mountains. Spend time at the otherworldly Moon Valley; spot flamingos at the Salar de Atacama salt flats; or be mesmerised by the geysers at El Tatio. Night time brings another opportunity for adventure and the ultimate stargazing experience. The Atacama has one of the clearest night skies on Earth and several top-level observatories have set up home here. Day 6: San Pedro de Atacama – Santiago – Guayaquil, Ecuador. Leave the desert behind and return to Calama for your flight to Santiago where an A&K representative will assist you with your connecting international flight (not included) to Guayaquil, Ecuador. On arrival into the gateway to the Galapagos Islands, meet your guide who will transfer you to your luxury boutique accommodation. Guayaquil, officially Santiago de Guayaquil, is the nation’s main port and is located on the western bank of the Guayas River. Discover a city with a rich blend of nature, history and tradition your own way. Climb the 444 numbered stairs to the top of Santa Ana hill for views over the city; stroll through Las Peñas neighbourhood, which took its name from the cliffs and limestone rocks during the Spanish settlement in the 15th century or wander along Simón Bolivar pier and explore some of the museums and craft stores. Alternatively, you may wish to discover more about Guayaquil’s religious side visiting seven churches on the “Route of Faith”. Later get your first taste of the country with a chocolate experience like no other. Pick your own cacao pods and watch as they are transformed into decadent chocolate. 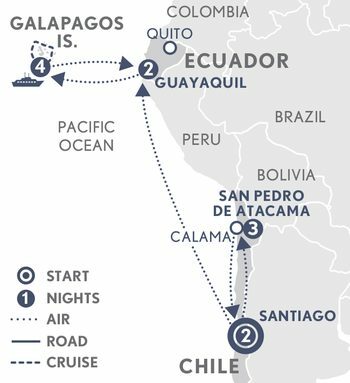 Day 8: Guayaquil – Baltra – Galapagos Island Cruise. Enjoy a private transfer to the airport for your flight to the Galapagos Islands. Your Guardian Angel will welcome you at the VIP Lounge area of Baltra Airport and assist you through customs before accompanying you on the private transfer to your cruise vessel. Following a safety and welcome briefing your adventure will begin. Set sail for Las Bachas Beach, a beautiful white-sand beach on the northern coast of Santa Cruz Island. Take a gentle stroll along the beach and keep an eye out for the sea turtles who lay their eggs at the edge of the vegetation. Or spend time in the waters snorkelling amongst the wrecks offshore. Day 9: Galapagos Island Cruise. Witch Hill, named for the Spanish bird known in English as the vermilion flycatcher, is a tuff cone hill located southwest of San Cristobal. Board a zodiac and cruise into the amazing rock formations along the island shore. Spend time at the white sand beach and snorkel in the crystal-clear waters. Visit Kicker Rock, an impressive geological formation, where sea birds nest and curious sea lions frolic. Snorkel in the waters around the rock and observe the marine life such as fish, turtles, sharks and rays. Continue to Isla Lobos where you can observe a small population of blue-footed boobies, frigates, and marine iguanas. Snorkelling with sea lions in this calm bay is a highlight of the excursion. Day 10: Galapagos Island Cruise. Explore endemic wildlife on Española Island, the southernmost island in the Galapagos archipelago, which is home to several wildlife species, including masked and blue-footed boobies. Marvel at the spectacular views from the top of a cliff. Cruise to Osborn and Gardner islets where snorkelling is a highlight for the amazing underwater marine life. Gardner Bay provides an excellent beach for swimming. The bay is frequented by colonies of sea lions which may also like to swim with you. Next stop Point Suarez, one of the most outstanding wildlife areas of the archipelago, with a long list of species found along its cliffs and beaches. Day 11: Galapagos Island Cruise. Santa Fe is one of the most entertaining destinations for shore excursions in the Galapagos Islands. You can choose one of two trails this morning. One takes you to the tallest Opuntia cactus (or prickly pear) in the Galapagos while the other trail takes you into the highlands where land iguanas can be seen. Following your walk, enjoy a swim in the calm waters or snorkel with playful sea lions. This afternoon explore South Plaza Island. With its unique Sesuvium plants and Opuntia cactuses scattered across the landscape you will encounter some of the most interesting wildlife observations available in the Galapagos. Observe land iguanas from the trail, under the shade of cactuses, waiting for a prickly pear to fall. Day 12: Galapagos Island Cruise – Baltra – Guayaquil. Begin with a morning visit to the Charles Darwin Research Station on Santa Cruz Island. Comprising a museum, library and a tortoise breeding station, you can encounter tortoises of different subspecies as they are prepared for reintroduction to their natural habitat. Disembark your cruise just after lunch and accompanied by your Guardian Angel take a private transfer to the airport for the return flight to Guayaquil where your journey ends.